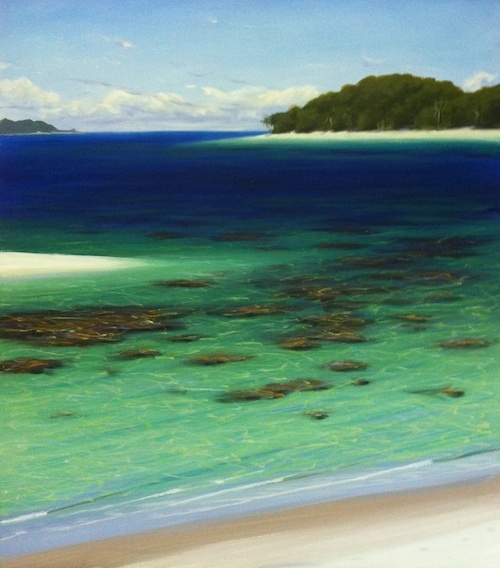 Learn how to paint this gorgeous tropical beach! Episode 1 is viewable FREE. Right here. Learn how to paint this gorgeous, luminous beach landscape in just 4 short episodes! Dimension. Colour. Light. Realism. Magic. All Yours. It will take time to download - please be patient - testing shows approx 10 minutes minimum for the smaller file and an hour minimum for the larger file. PDF - Tropical Beach "Recipe"
PDF - Tropical Water "Default Settings"
PDF - Trees, Foliage & Grass "Default Settings"
Episode 1: The basics, get 'em down! 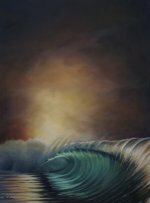 Gradation - Master this fundamental skill in multiple zones to give your paintings fantastic depth. Roughing In - An important process. Brush Technique - Controlling your brush to create patches of coral, cloud banks and distant islands. Learn the versatility of wet-in-wet. 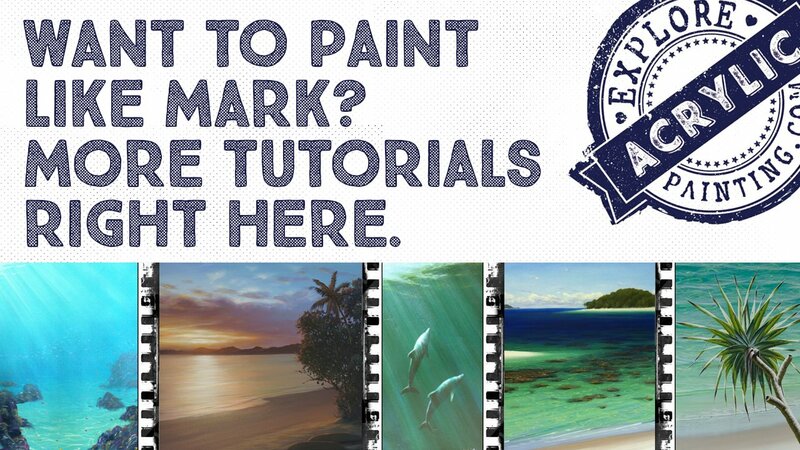 Troubleshooting - Discover simple tips to bring dimension and life to your tropical beach painting. Fast. 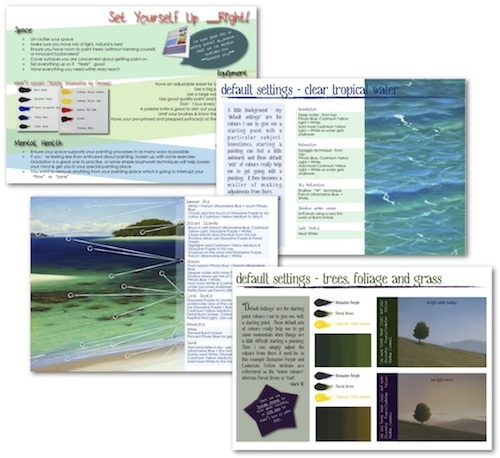 Default Settings - An introduction to the concept of using a set of colours to help you get some colour down quick. Blending Techniques - create smooth transitions for maximum effect. Dimension in Sand - using reflections to create realism. Atmospheric Depth - represent distant islands with ease. Learn to Dance - learn why letting your painting lead you is more fun than wrestling with it. Trouble? Fix errors with ease. Perspective - use directional brushstrokes to create dimension and illusion. Establishing Elements - create coral shoals of varying heights. 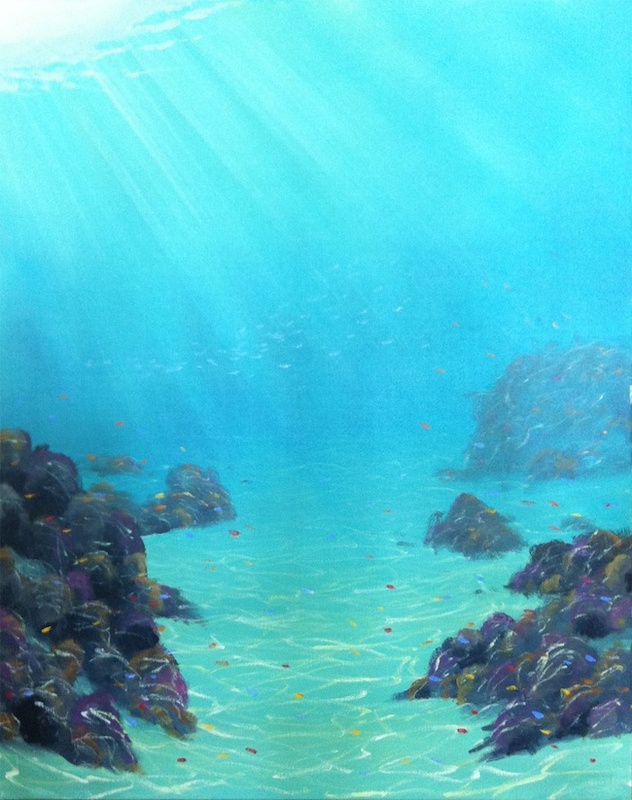 Understand how to create realism & zing in your underwater elements using plenty of colour. Transitions - understand how to treat transitions from deep water to shallow, to get the clarity & luminosity YOU want. Reflections - add even more realism with one simple tip. Refraction - light, light, light! Hurrah! Distance - simple tips to push elements back even further! Dimension - subtle and simple techniques for added realism. Information - what can you leave out and still get your point across? NB: This is a LARGE file and will take some time to download. It has been optimised for the best viewing size versus download time. If you have a strong broadband connection & data available your download could take about an hour at a minimum. Our advice? Set it up to download overnight. Please double check your bandwidth and data allowance before ordering, as this product is only available as a download. NB: This is STILL a LARGE file and may take some time to download. It has been optimised further for viewing size versus download time - optimal viewing will be on tablet size screen or smaller. If you have a strong broadband connection & data available your download could take about ten minutes at a minimum. On purchase of your V-Log "Tropical Beach - Complete Volume (Large or Smaller)", you will receive via email (the one you have with your Paypal account) download links which are specific to your computer. 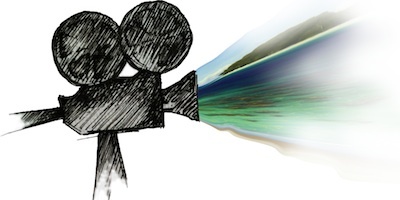 One for your video file, and one for your bonus PDF(s) file. To download the files, simply click on the link(s). Your download should start automatically. There is a time limit and attempt limit setting on the links (to keep out those nasty pirates!) but don't worry, if you need more attempts - which hopefully you won't - just contact us and we'll send you what you need. ***NB: Note for iPad owners**** - it has come to our attention that if you attempt to download the v-log to an iPad it may not let you save the file (you may only be able to view it). Therefore please use a different computer platform to download and save the file (ie your PC or laptop). Happy Painting! Thankyou for your Support! I loved the v-log because, for me, it 'demystifies' the act of creating a painting by breaking down the process into easy steps which can be practised and adapted at leisure - when it suits me! Mark provides the recipe and reveals 'insider tips' for painting a tropical paradise, explaining what ingredients are needed and the method we need to pull it all together - all we need to do is to listen up, apply the knowledge (you can always rewind if you missed it the first time!) and practise enthusiastically! Plus it's available 24/7. I truly did love it. I've watched it twice now, and picked up different items of interest each time - and I'm sure this sort of thing will continue as I grapple more with my own paintings and apply the new 'knowledge' I'm taking on board from watching Mark as he paints. Just not sure how to put that into words. Ah well. 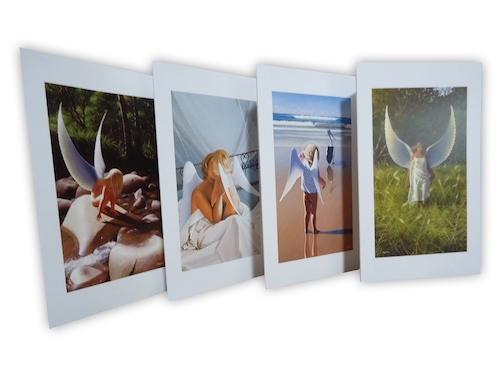 Send us YOUR testimonial about the v-log "Tropical Beach" and receive a free 4-pack of Mark's "Angel" blank image cards. Contact us to send us your thoughts on our latest v-log now! If you really like this downloadable tutorial and want more......wait for it.....have you seen the first V-log yet? "Coral Reef - Underneath" is available for download now! 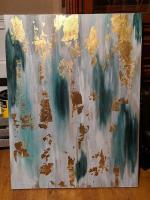 Learn how to paint this piece of gorgeousness in just two short episodes. Only AUD$15. Even less if you're an AA subscriber.